The Swiss indy bottler Chapter 7 seems to be taking the whisky world by storm. The one-man company from Selim Evin already released 5 single casks in a year and has a few tricks up his sleeve for the coming months. The stylish black boxes are a homage to the Swiss design style. The Allt-a-Bhainne and the Glen Keith were already very promising. Chapter 7 bottled another ex-bourbon single cask from Speyside from a lesser known distillery. One should almost think it is becoming the company's trademark... Let's see how this Glentauchers performs. 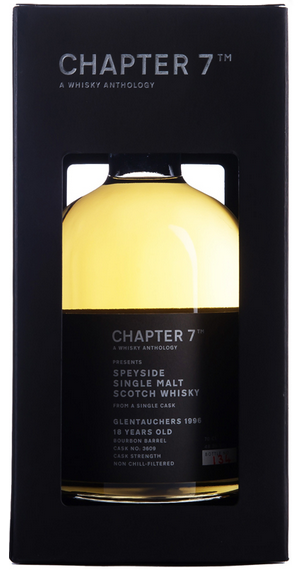 Colour: This Glentauchers from Chapter 7 is pale yellow in colour (comparable to the Glen Keith from the same bottler). The whisky shows some nice thick and slow legs against the glass. This might be a sign of a delicious creamy texture. Nose: The nose starts very promising with mineral notes and bourbon fruitiness. Melon and bananas. White chocolate with passion fruits. A lovely creamy pannacotta and coconut. A slight hint of citrus fruits. Bergamot maybe? Water creates a leading role for the coconut. I'm getting something like a Bounty with white chocolate. Balsa wood and tart loaded with gooseberries. Taste: The creaminess that was promised is definitely present. A powerful burst of fruitiness. Mashed bananas and Betterfood cookies with some juicy oak. Water brings back the mineral notes and dried coconut flakes. Wood, pepper and baked bananas. Finish: Quite a long finish with those lovely mineral notes. The juiciness and creaminess really stick to your palate. A hint of yellow boiled sweets. I'm a big fan of this Glentauchers from Chapter 7. It may hide its age a bit, but the lovely creamy notes definitely make up for it. A worthy chapter in the book from Chapter 7! Update: Jurgen's Whiskyhuis has it in his webshop for €118 (£84.50). Disclosure: A review sample was provided by Chapter 7. Thanks for the sample, Selim!